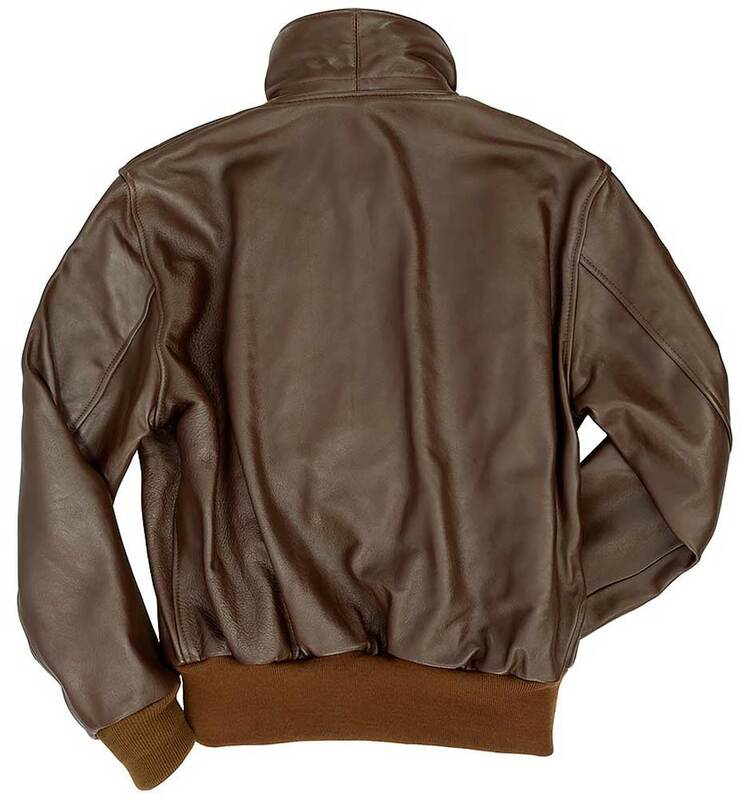 When nothing but the real thing will do... his authentic russet brown Horsehide A-2 Flight Jacket will meet your requirements. 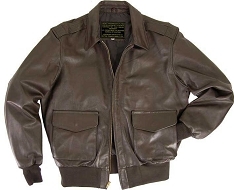 Horsehide was used during the 1930's and 1940's by the USAAF when hides were abundant. 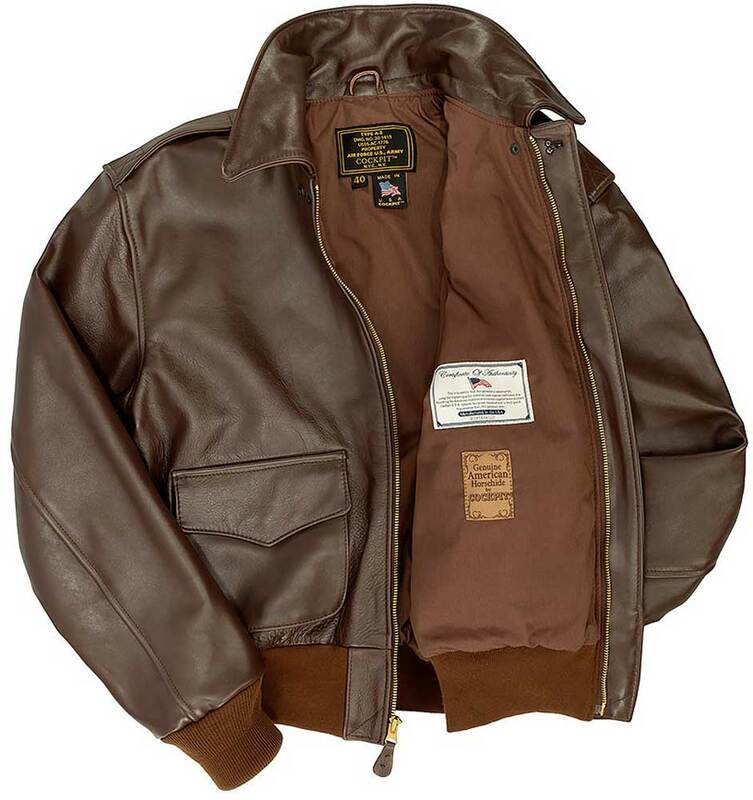 Manufacturers changed to Goatskin in later years, but Horsehide 'til this day has always remained the preferred choice for pilots. Nothing wears like Horsehide; as it ages it develops a patina for a rich antiqued look. 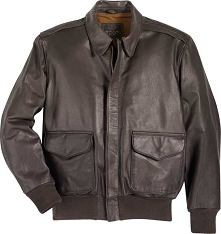 It is also extremely durable and will provide years of wear - many Horsehide A-2 Jackets from WWII are still around today! In Long version from 42-50. Just got my Horsehide A-2 jacket on Saturday and am highly pleased with the product. Rock solid construction and love the color of the leather ! 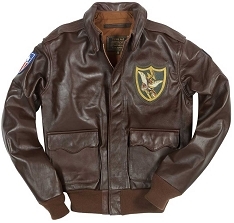 Long time student of the A-2 and in particular nose art jackets from WW II. 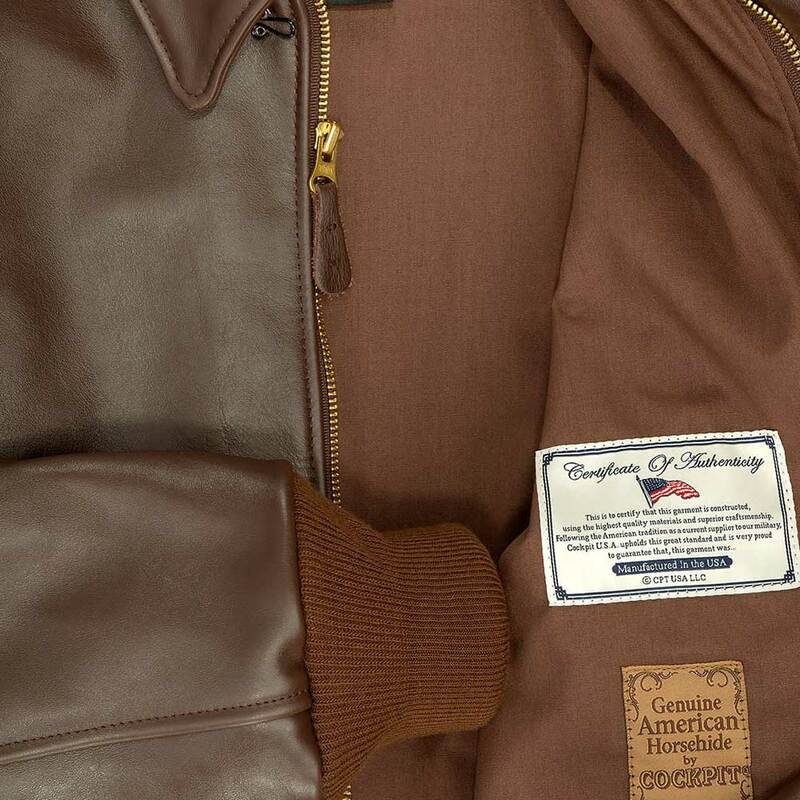 The stitching on this jacket is outstanding and its true to its original design from WW II ! Very proud to honor that generation when I wear it ! Thanks for making this product and it arrived quickly ! Thanks You ! my favorite a-2 now! 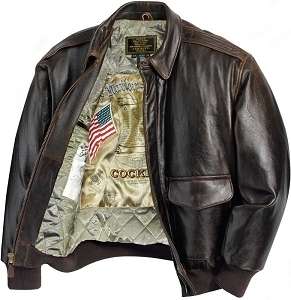 this jacket proudly proclaims on the lining, ''American Horse'': according to federal law no u.s. horsehide can come from anything else but natural death horses...no horses killed for hides, pet food, etc...so i do see the jacket as honouring the animal...for those who care about that... otherwise, the jacket is amazing...it has the squared off and trim fit of military spec sizing, and everything else on this jacket is all milspec! 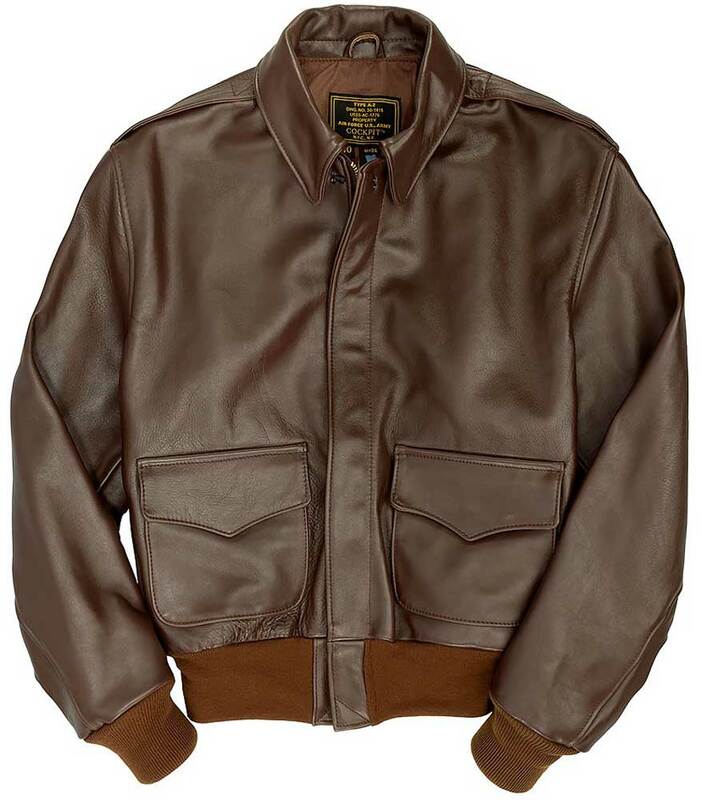 the sizing being military you must get one size larger to fit like your civilian size, and i''d recommend the long version...tho $30 more, these run short, like belt high almost... ...this jacket looks very authentic to ww2 styling and dimensions...it ...this is totally authentic to all milspec aspects and looks superb...as for horse vs. goat... horse appears to be a bit lighter weightwise, warmer, and of course stiffer/stronger requiring wonderfully a bit more of an enjoyable break-in period... this jacket scores 100+ out of a hundred! The jacket is exactly as portrayed. Excellent Quality. I ordered one size larger because of the trim fit and that turned out to be perfect. it fits and looks awesome. Happy with the purchase. This A2 is excellent in many ways. The level of craftsmanship is very high. The Russet Brown colour is truly WWII, which is hard to get these days. Most modern A2's are made in Dark Brown, or Seal Brown as they call it. Just after I placed the order I asked Cockpit USA directly about the leather, and I was informed in writing that the Horsehide used was FULL GRAIN. I think this is a very important piece of information that is not mentioned anywhere in the website or labelling. For the price we pay it's really good value for money. I love this jacket, it fits me very well. I am 174cm and 76kg, and I picked size 44R. I have seven A2's jacket, and this one is on the top of the list. The last thing I want to mention, but not the least, is the level of customer service of ACE Jackets. I had several contacts with them through LIVE CHAT, one in particular was Angelica, and also Roxanne who provided me with details of the sizing. Angelica gave me the best deal with discounts for the jacket and shipping, also the tracking, when the jacket seemed to be stuck in JFK Airport. I would like to thank her again for her friendliness, and encourage other buyers to talk to her before purchasing.